New tower, at left, is to rise along Ninth Avenue. 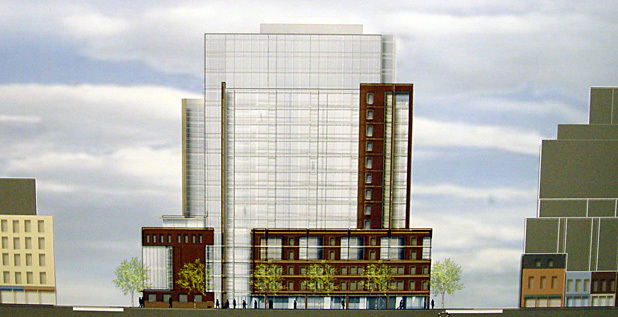 View in rendering is from north on 21st Street. It is not easy to squeeze an institutional campus into the fabric of a developed city as evidenced by the continued controversies over the expansions of Columbia and New York Universities in Manhattan over the past few decades. Given the activism of many community and neighborhood groups, it is not even easy to do when the institutional already has a campus and simply wants to expand within it as evidenced by the recent inability of the Fashion Institute of Technology to close 27th Street between Seventh and Eighth Avenues, a block on which it owns virtually all the buildings, so that it can have a "real" campus. The General Theological Seminary occupies the entire block between Ninth and Tenth Avenues and 20th and 21st Streets in the heart of Chelsea and the Chelsea Historic District. It wants to replace Sherrill Hall, a five-story building that now occupies its frontage along Ninth Avenue with a 17-story, mixed-use tower and on November 21, 2005 it made an informational presentation before Community Board 4. Sherrill Hall, which was designed in 1960 by OConnor & Kilham, is an attractive, but not inspired building that bears little contextual relationship to the older brownstone buildings of the seminary. The seminary's older buildings are not architecturally very distinguished but historically they are among the most important landmarks in Chelsea and they are bordered on 20th and 21st Streets by two of the loveliest blocks of townhouses in Chelsea. The seminary does have a nice chapel tower and attractive gardens that are visible from 20th Street. Because the seminary is in the Chelsea Historic District, approval of the plans will be needed from the city's Landmarks Preservation Commission. At the community board meeting, which was jam-packed and very raucous, the Very Rev. Ward B. Ewing, Dean and President of the seminary, said it was "at a critical moment in its 190-year history" and is faced with "urgent problems." He said that Sherrill Hall and other structures "are severely damaged." He said that since 1999, the seminary has spent $9 million on restoration but needs $50 million to $60 million to preserve its buildings. About 30 people, including many students at the seminary, signed up to speak in favor of the plan and about 50 people signed up in opposition, but because the hearing was regularly interrupted by a front-row heckler not everyone was able to be speak. The seminarys block has about 240,000 square feet of unused air-rights and the proposed building would only use about 185,000 square feet. The Polshek Partnership is the architect for the new building, which would include 50,000 square feet for the seminarys library and offices and 135,000 square feet of apartment space. The developer is the Brodsky Organization. The building would have a double-height lobby along Ninth Avenue that would permit views through the building to the close. 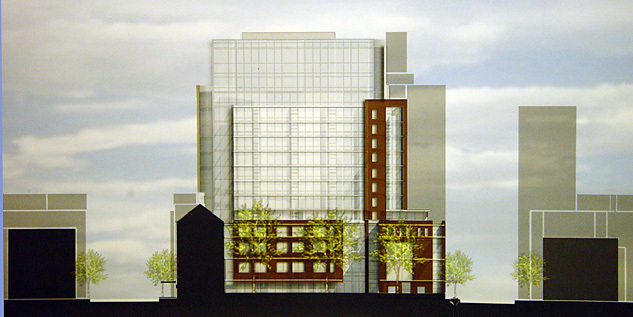 The northern part of the frontage along the avenue would be used by the seminarys bookstore, but Robert Trentlyon, a Chelsea resident, argued at the meeting last night that it should be used for major high-end retail space that would bring the seminary more money and permit it to build a less tall building. The seminary maintains a daycare center, a homeless shelter and Alcoholic Anonymous meetings on its campus. Most of those speaking in opposition were concerned about the height of the building, despite the fact that it is the same height as a 1928 apartment tower just across Ninth Avenue. The new tower would be a bit higher than the seminarys church spire in the center of the block. One speaker said that the seminary "has far more space than it needs" and another one declared that the community "certainly doesnt need any more luxury housing" and Michael Thayer said "a garden is not more important than air and space." Several of those in opposition also said that the seminary until very recently did not make its gardens readily available to the public. The plan calls for the building to have about 80 apartments, and a garage for about 130 cars. ," he said, "and will provide a spacious room that will be available for exhibits or meetings by community groups and organizations." The design of the proposed new building is complex. The base of the building would continue the 51 1/2-foot-high brownstone streetwalls of the campus and the southwest corner at 21st Street would have the brownstone cladding rise up much of the height of the new building, which will be covered mostly in glass. This treatment is also used at the rear of the tower, facing the gardens. The brownstone portions of the base of the tower do not wrap entirely around it as the glass of the tower extends to the bottom for narrow portions on both its east and west facades to demarcate entrances. In fact, the four facades of the tower's base are all different. The south facade, for example, has very large windows that enclose the library. In recent years, several major towers at the south end of Times Square have featured similarly complex designs with different facades. Such an approach is interesting, but not always successful. The visual cacophony can be confusing and often does not reflect a "form follows function" design. It is certainly a far cry from the cookie-cutter mentality that for too long dominated much of the city's commercial and residential high-rise design, but it is also quite a leap away from the purity, simplicity and elegance of a unified design. Often, one gets the feeling that the complicated designs are rather "forced" and "show-offish," but there is no hard-and-fast rules. Indeed, given the city's post-war history, it is hard to argue against the "new" complexity, which is, in part, an alternative to decorative, Post-Modern-like flourishes and one has to applaud experimentation, especially when dealing with such expensive ventures. James Polshek has designed some superb buildings such as 500 Park Avenue Tower on East 59th Street that meshes wonderfully with the adjacent Modernist low-rise building at 500 Park Avenue, and he has designed a brashly non-contextual new entrance to the Brooklyn Museum of Art. Here, his firm's solution is good, but probably could use some more tinkering. The biggest design problem is the brownstone cladding that does not extend to the top of the tower. The decision to continue the brownstone walls of the older buildings around the base is excellent. The question is whether the cladding should climb up the tower, or just be relegated to the base, or whether it should completely enshroud the tower, or whether it should cover more of the tower. The solution put forward by the Polshek Partnership most likely took its reasonable cue as to the height of the brownstone cladding from the enclave's mid-block tower including the finials. The new tower has neglected to include any finials of its own, which might have been a nice doffing of the cap, so to speak. The solution also limits the height of the new tower and is the same as an apartment building across the avenue, a not irrational approach albeit one that still irked many community residents professing to be concerned about the neighborhood's precious "light and air" as opposed to their own views or draw-up-the-drawbridge mentality (a.k.a. NIMBY - Not In My Back Yard). This tempest in a courtyard is reminiscent of the great landmarks fight over a plan to erect a good-sized skyscraper in the front garden of St. Bartholomew's Church on Park Avenue just across the street from the Waldorf-Astoria Hotel (see The City Review article). 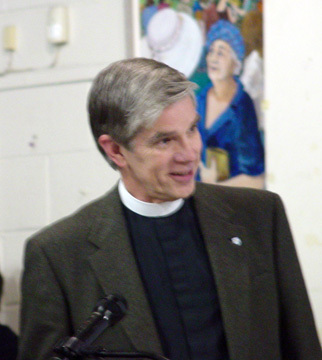 In that rather nasty dispute, the church's leader suggested that dissidents ask what Christ would do. The leader had argued that the proposed tower would provide the church with significant revenues to carry out its missions. Many of those who spoke in opposition to the seminary's plans were not very charitable. One speaker said that the gardens were not more important than the neighborhood's light and air, an incredibly warped illogic. Somewhat less crazed were the comments of several anti's that the seminary's tower would set "a dangerous precedent" that would lead to the area getting more tall towers. Several of these speakers wanted to keep the tower's height to no more than 7 and a half stories, apparently confusing height with F.A.R. (floor-to-area ratio) since the existing as-of-right zoning for the site is 7.5, but F.A.R. only relates to building bulk, not height. The seminary's plan obviously was thought out to minimize community opposition to tall towers and one could probably argue effectively that it perhaps should be considering a much taller tower since the seminary is Chelsea's principal landmark (perhaps rivaled only by the taller London Terrace residential enclave a couple of blocks to the north, or the Chelsea Hotel on West 23rd Street). A taller tower would become a significantly more visible "landmark" for Chelsea and, perhaps more importantly, provide greater views for the apartments, which would provide the seminary with greater revenues. 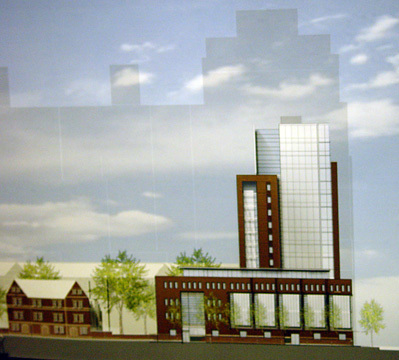 A taller tower, located on the northwest corner of Ninth Avenue and 20th Street, furthermore, would be a less bulky and dominant intrusion onto the "campus," less obstructive of views of the existing mid-block church tower, and an opportunity to be make a more interesting architectural statement of the seminary's historical vision and commitment to the neighborhood. Such a tower could open up views of the inner gardens more, and still wrap the base with brownstone and provide a more lively, better lit retail frontage along Ninth Avenue. Of course the design of such a tower would still present challenges. Should it be in light-colored material, or glass, to contrast with the existing architecture, an approach recently taken by Sir Norman Foster for a very tall tower at 610 Lexington Avenue that will abut the Seagram Building on Park Avenue and use its air rights (see The City Review article)? Or should it be clad in dark materials or bronze glass to complement the existing architecture? The point is not be daring for the sake of daring, or patronizing (to the community) to the point of stifling or limiting institutional missions. The point is to create something memorable, workable, and inspiring. High-rise buildings are not inherently horrible. They can be well or poorly done. Historic preservation need not wear blinders. The immediate neighborhood has lots of not small and bulky developments such as Fulton Towers, or the huge 111 Eighth Avenue building. Along with TriBeCa, Chelsea is one of the "hottest" real estate markets in the city and is enjoying an incredible and very lively renaissance. Most speakers, on both sides of the proverbial fence, at the community meeting seemed to agree that the seminary's existing building along Ninth Avenue is less than inspired and the seminary's speakers make a strong case for the need to restore and maintain their older buildings. The city has made significant progress in the past few years in altering its design "sensitivity" and the NIMBY syndrome has eased somewhat, but not enough. One of the speakers for the seminary argued, correctly, that its students and its work reach out beyond its neighborhood. Neighborhoods are, of course, important, even if they are not always easy to quantify. In the spirit of good-neighborliness, the community here should be supportive of the seminary's needs and constructive rather than destructive, conscientious rather than conservative. And both sides should be appreciative of the complexity of architecture, both old and new. Architecture is the most public of arts and often the most permanent. It is never enough to think only of what is best for the client, but of the community at large, even if that goes beyond the neighborhood. Chelsea may not need a Calatrava-esque, or Foster-esque skyscraper, but why not something that locates the very vibrant and wonderful community of Chelsea on the city's skyline? 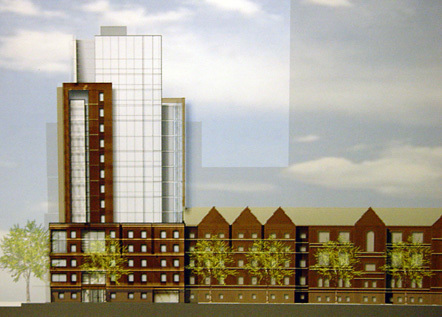 The seminary's plan met great resistance with the community and eventually the seminary revised its plans and lowered the height of the 17-story planned building to 15 stories. The second design was not bad, but the community activists were adamantly against it on the grounds that it violated the area's new zoning limitations on building heights and they insisted that the building not be taller than 75 feet. The seminary went back to the drawing board and came back with a 7-story building on the avenue and a new 5-story building on West 20th Street. Still, the community was unhappy with the design of the building on the avenue as being too glassy. The seminary redrew its plans once again and in September 2007 the Landmarks Preservation Commission approved the new plans. As a result of the community activists' pressure, the community is getting a pleasant but uninspired low-rise building on the avenue and the seminary will not get enough revenue from the developer to take care of needed restoration and maintenance of its campus. The community board's hard line indicated that it has no sense of charity and no sense of civic pride. To maintain that the seminary could not built a structure as tall as some of its immediate neighbors is downright mean, nasty, onery and outrageous, especially since the seminary is not using all of its available development rights and since the recent rezoning deprived them of the possibility of selling them for the development of affordable housing nearby.